September 25th in WordPress Themes by Wordpress Jedi . Organizing events is not as easy as some make it look. You will need plenty of things to go right for your event to go without a hitch. A good looking website is also required to promote your events. Venue X for WordPress can help. 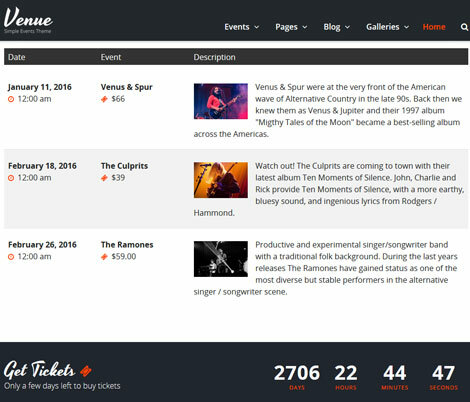 Designed for small event venues and theaters, this theme lets you list event, sell tickets, and share your news with the world. Venue X has a responsive design. You can customize header, fonts, colors, and pages from the backend. This theme has boxed and wide layouts. It has plenty of customizable page builder blocks to allow you to put your site together faster. You also get 18 custom widgets, 20+ custom shortcodes, and 10+ page templates. This theme is compatible with bbPress, the Events Calendar, and WooCommerce. It comes bundled with Slider Revolution. Your visitors will be able to view events and RSVP on your site. This is a commercial theme by an Elite Author.